How to turn a tennis match into a cinematic experience full of tension and emotion? That’s what the Swedish filmmaker Janus Metz gets in his debut, presented in the Pearls section of the San Sebastian Festival after his visit to Toronto. 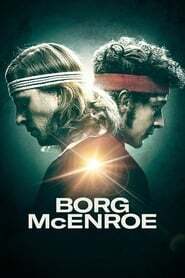 The film is responsible for approaching the controversial personalities of two of the greatest players in the history of tennis, Björn Borg and John McEnroe, just at the moment they met for the first time in what is still considered the game of century (of the last century, of course), the Wimbledon final of 1980. At that time, the Swedish Björn Borg, with only 24 years, had managed to win that tournament four times. He was at the height of his career and his promotion had been unbeatable since he became a teen idol of the sport after his debut with 15 years in the Davis Cup. If he won the fifth Wimbledon he would go down in history. But a new opponent had emerged along the way, John McEnroe. The media began to consider him an enfant terrible, an outsider and a pimp who had such a bad temper and was so enraged at every game that he ended up breaking rackets, insulting the judge and getting involved with the public. In a television program they even called him “The man who worst defended American values from Al Capone”. That’s how bad it fell.